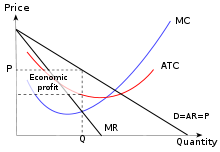 In economics, profit in the accounting sense of the excess of revenue over cost is the sum of two components: normal profit and economic profit. All understanding of profit should be broken down into three aspects: the size of profit, the portion of the total income, and the rate of profit (in comparison to the initial investment). Normal profit is the profit that is necessary to just cover the opportunity costs of the owner-manager or of the firm's investors. In the absence of this profit, these parties would withdraw their time and funds from the firm and use them to better advantage elsewhere. In contrast, economic profit, sometimes called excess profit, is profit in excess of what is required to cover the opportunity costs. 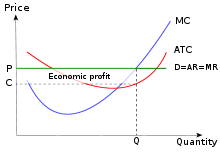 The existence of economic profits depends on the prevalence of barriers to entry: these stop other firms from entering into the industry and sapping away profits, like they would in a more competitive market. To understand the barrier, see it as certain fixed cost to entry the market for a new firm. In cases where barriers are present, but more than one firm, firms can collude to limit production, thereby restricting supply in order to ensure the price of the product remains high enough to ensure all of the firms in the industry achieve an economic profit. An extreme case can be monopoly, which is able to achieve the most desirable profits at the most time compared to other non-monopoly companies. The social profit from a firm's activities is the accounting profit plus or minus any externalities or consumer surpluses that occur in its activity. An externality including positive externality and negative externality is an effect that production/consumption of a specific good exerts on people who are not involved. Pollution is an example for negative externality. Consumer surplus is an economic indicator which measures consumer benefits. The price that consumers pay for a product is not greater than the price they desire to pay, and in this case there will be consumer surplus. A firm may report relatively large monetary profits, but by creating negative externalities their social profit could be relatively small or negative. It is a standard economic assumption (though not necessarily a perfect one in the real world) that, other things being equal, a firm will attempt to maximize its profits. Given that profit is defined as the difference in total revenue and total cost, a firm achieves a maximum by operating at the point where the difference between the two is at its greatest. In other words, the firm wants to maximize its production without overwhelming marginal cost. 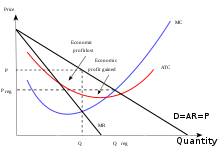 In markets which do not show interdependence, this point can either be found by looking at these two curves directly, or by finding and selecting the best of the points where the gradients of the two curves (marginal revenue and marginal cost respectively) are equal. In interdependent markets, game theory must be used to derive a profit maximising solution. Thurow, Lester C. (2008). "Profits". In David R. Henderson (ed.). Concise Encyclopedia of Economics (2nd ed.). Indianapolis: Library of Economics and Liberty. ISBN 978-0865976658. OCLC 237794267.